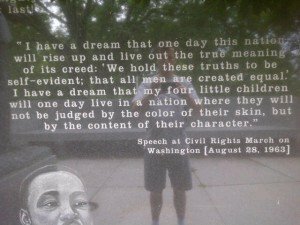 I visited a memorial to Dr. Martin Luther King recently and found myself transfixed on the quote shown above. As I looked at the statue and then back to the quote, I am not ashamed to admit I came to tears. In examining why I had that reaction (beyond being in awe of such a great human being), two things, one personal and one professional, emerged for me. On the personal side I was thinking of my fabulous daughter-in-law (the latter part of that title bugs me, she is my third daughter) who is African American and the mother of the two greatest daughters, and my granddaughters (bias intended), anywhere. I’ve heard stories from her about some of the negative experiences she has endured and admire her strength to just grow from those. For my son, the story is quite simple. He fell in love and nothing else mattered. Still, I worry for my granddaughters as I read stories, track Twitter feeds, and catch news items where race has been the central excuse for negative behavior. I wonder if there will come a time where they will simply be judged “for the content of their character and not the color of their skin”. And I weep some more. ➢ In 2005, the on-time graduation rate for black males was 48 percent nationally; for white males it was 74 percent. ➢ Nearly half of the nation’s African American students, but only 11 percent of white students, attend high schools in which graduation is not the norm. ➢ On average, African American and Hispanic twelfth-grade students read at approximately the same level as white eighth graders. ➢ The National Assessment of Educational Progress reports that 88 percent of African American eighth graders read below grade level, compared to 62 percent of white eighth graders. ➢ More than 60 percent of black students attend schools where more than 50 percent of the school population is identified as living in poverty, compared to 18 percent of white students. ➢ In the forty-nine states studied, the school districts with the highest minority enrollments receive an average of $877 less per student than school districts with the lowest number of minorities enrolled. ➢ In high schools where at least 75 percent of the students are low-income, there are three times as many uncertified or out-of-field teachers teaching both English and science than in schools with wealthier populations. I’ve been working in schools where these statistics are the norm and drive the expectations for (lack of) success. Dr. James Norwood put together this infographic (http://bit.ly/M0Wlgf) that shows the devastating social and financial impacts of dropping out. The passivity and resignation that occurs when a black student is identified as struggling is mind-boggling. Are we harder on white students who struggle and do we try to push them to “get it”. Can any educator take solace in a graduation rate that suggests one in two students won’t be successful? Is our perception of low achievement for black students the cause or the byproduct? Or, as Rutgers-Newark professor Kent D. Harber suggests in this study http://www.sciencedaily.com/releases/2012/05/120504143023.htm, are we giving inaccurate feedback that does not provide black students the same intellectual growth and foster achievement? Have we institutionalized the very thing Dr. King was trying to eradicate? And I weep some more. ➢ Among blacks ages 25 and older, 82% have at least a high school diploma (as of July 2007) versus 14% in 1950. ➢ Among blacks ages 25 and older, 19% have a bachelor’s degree or higher (as of July 2007) versus 2% in 1950. And then I get a chance to talk to Carlos who is a young African American man and my seat-mate for the first leg of my flight home. He is a man of many talents and interests, polished and well spoken, and willing to share his perceptions on my concerns. He let me know about the struggles his folks went through in order to create a better situation for their children. Carlos talked about two challenges – the institutionalization of failure for black students (as illustrated above) and the lack of positive role models or mentors. He went on to describe the various ways he is involved to set a positive example by volunteering his time to work with black youth who come from poverty or lack of success to let them know what is possible. He felt this was a critical component that was lacking in the structures and systems that African American kids were exposed to. He insightfully suggested they needed more than rappers and athletes to identify with as their only career options. I begin to smile. Perhaps Carlos and his generation, which includes my third daughter Sabrina, are what Dr. King was alluding to. Strong role models that will guide the next generation to take pride in the content of their character and their color so that others may be able to do the same. So pleased to be living in a country where the identification of one’s “race” is not required. We are all a blend of the many threads which have come to make up who we are in this lifetime and to me, to identify only with one or the other is to deny the totality of who we are. And to bury a part of one’s identity as if it doesn’t matter is also regrettable. I cannot imagine having to “choose”. Since my personal identity runs along nationality/ethnic lines, I find myself incorporating both Russian and German cultural factors into my identity. The skin colour I have is no less of my choosing than anyone else. Eventually, I think we will all be a delightful new blend of “tan” and the issue will be closed. Those who consistently refer to President Obama as a “black” president deny the totality of his identity. To my thinking, if you MUST state it, then he is “bi-racial”. Yes, he identifies strongly with the black community and rightly so, as it reflects his clearly evident concern for the well-being of ALL Americans, which for historical reasons has yet to be achieved. This, perhaps surprisingly to some factions in the U.S., is not a bad thing but it irks them to no end. That says more about them than it does about him. And the fact that he lived outside of the U.S. for a time is seen by some, those who oppose him of course, as anathema to the presidency itself. Will the words of Martin Luther King ever truly become reality? Living in Canada, my hope is alive. Working in a multiethnic school, and adding my efforts for all children to acknowledge their origins and personal diversity makes me feel that I am part of that “dream”. Thanks for a thought provoking blog. Hi Tom: It was so nice running into you yesterday at Maglios. I love this article, as it also hits close to home for me! My daughter-in-law, or 3rd daughter, as I also consider her my child now, is from East LA and is Spanish. This group of people also face huge challenges in the US and she is so in awe of living in Canada where the first question (or negative comment) has nothing to do with her skin colour. Add to this that she is also married to my daughter, and you can imagine that in the US, life has not always been easy. I am so thankful that in Canada (although we have a long way to go) that these beautiful young women can have a life together, with no one thinking twice about what makes them different than everyone else, but rather just accepting them for who they are, and celebrating what makes us all the same! Teachers who teach acceptance are what make the difference, because if gives kids a positive outlook, especially if the people in their own homes are not tolerant. Thanks to good teachers here in Nelson, my kids have a better understanding and tolerance that they would have had many other places in the world.